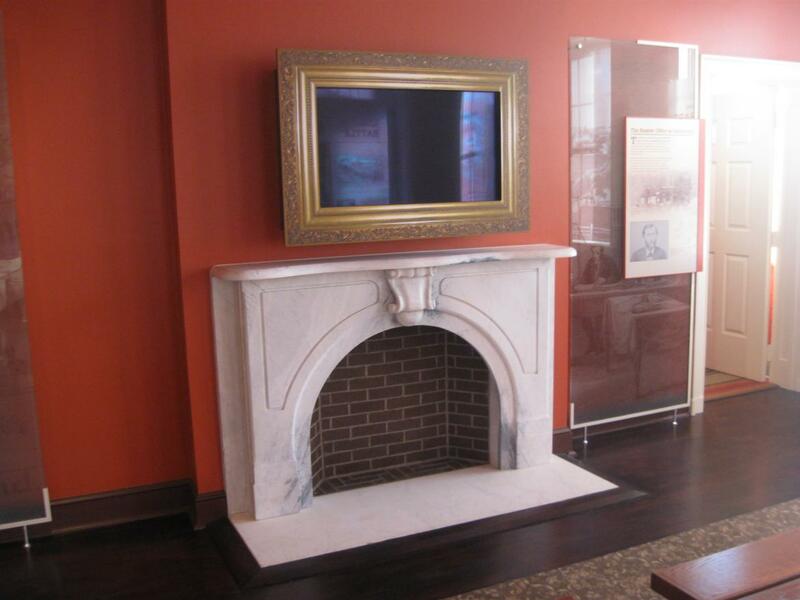 The west wall of the David Wills House parlor has three windows and three displays. This is the far left or south display on the wall. 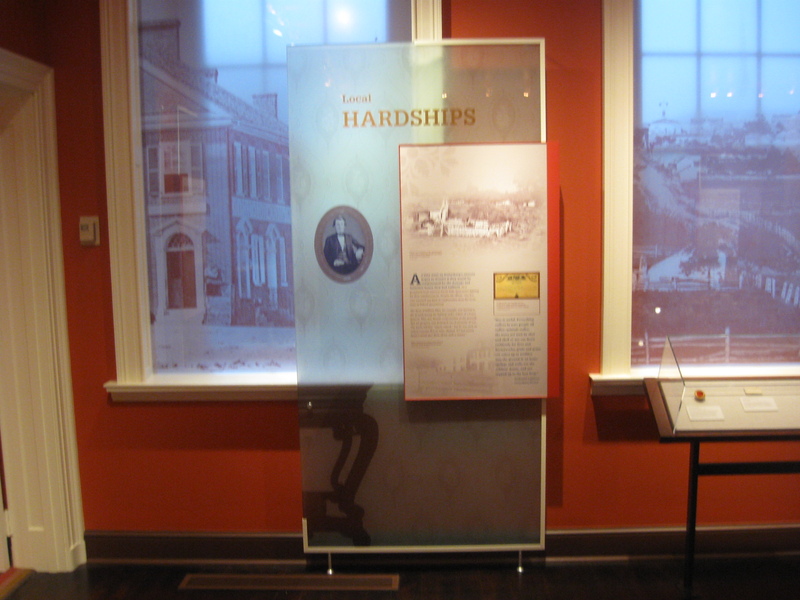 The left window contains an image of George Arnold’s store, on the southwest corner of the Diamond, which could have been seen from this window in the 1860s. The middle window on the right in this view looks down Middle Street from Seminary Ridge. This view could not be obtained from the Wills House. It’s too bad they couldn’t find one of the Schick building, or Boyer’s Grocery Store. This view was taken facing west at approximately 4:15 PM on Wednesday, February 18, 2009. 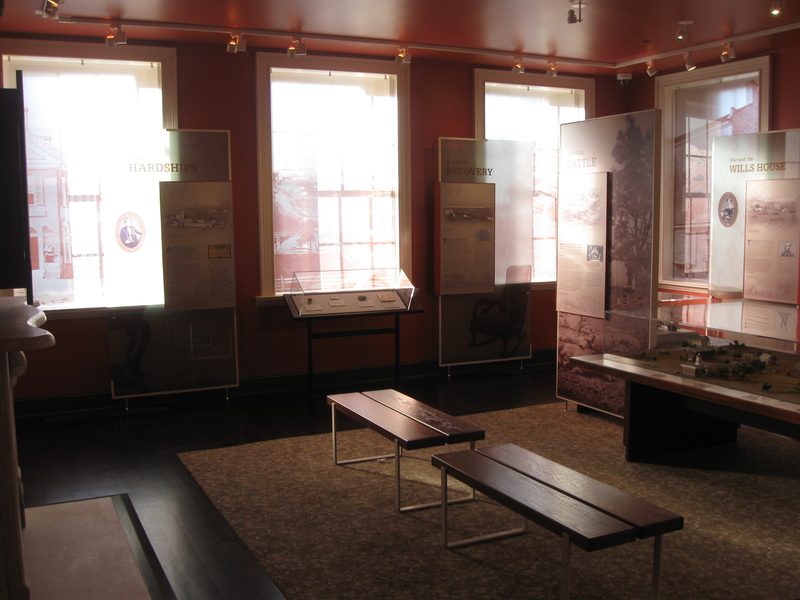 We continue our tour of the interior of the Wills House parlor by viewing the west wall. 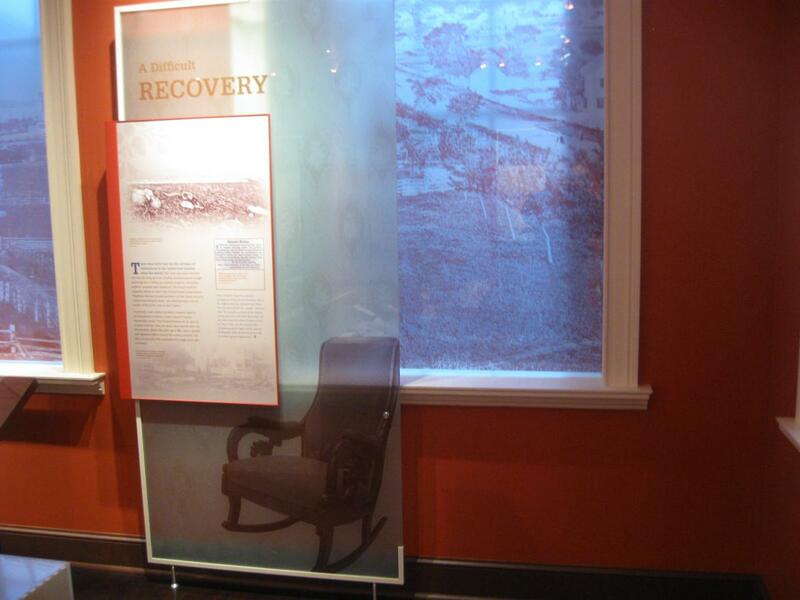 The wall has three windows and three displays. 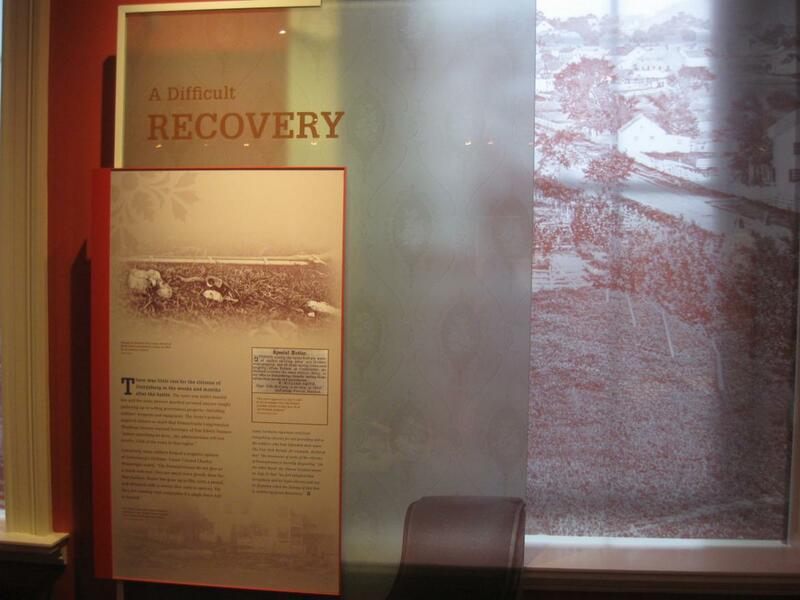 The windows are supposed to show what individuals would have seen from this area in the 1860s. Only one of the windows shows the correct image. Over the next couple of posts we’ll stay on the first floor. 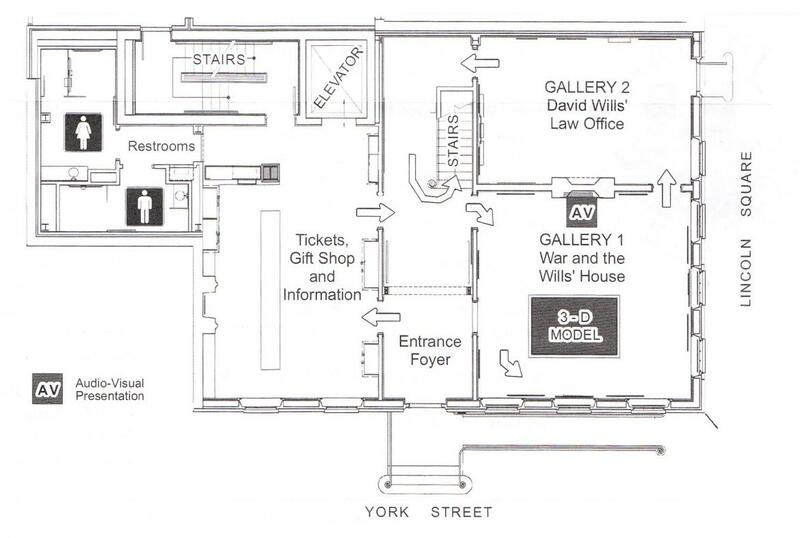 Today we’re in the the Wills Parlor, which is labeled “Gallery One, War and the Wills House.” This map is from the Wills House brochure which was scanned while we were facing south at approximately 7:00 PM on Wednesday, February 18, 2009. 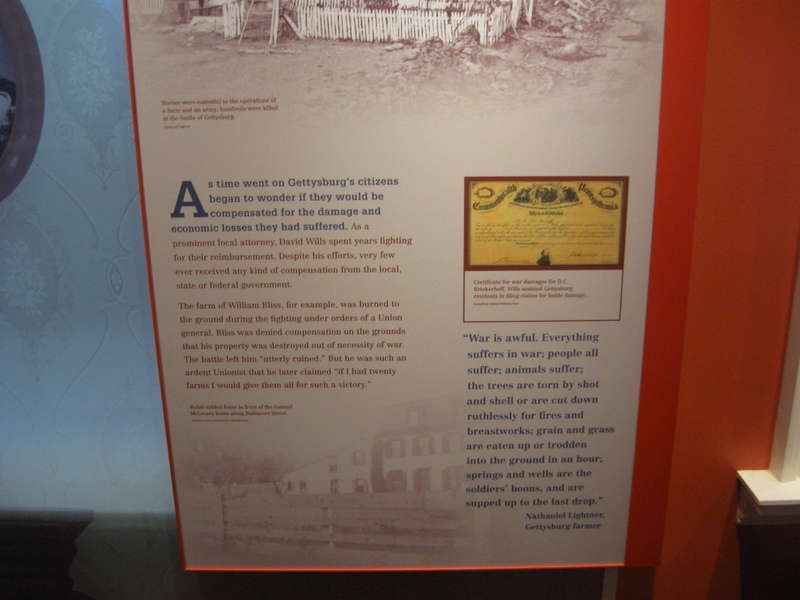 The theme of this panel is “Local Hardships.” This is a photograph of the Widow Lydia Lyster’s House (Meade’s Headquarters) along the Taneytown Road. This view was taken facing west at approximately 4:15 PM on Wednesday, February 18, 2009. Here’s the bottom of the panel. Remember to click on any of our images to make them larger. This view was taken facing west at approximately 4:15 PM on Wednesday, February 18, 2009. We are pitiful photographers, and this is our best image that shows the whole west wall. At least one can tell that there are three windows on the wall. This view was taken facing northwest at approximately 4:15 PM on Wednesday, February 18, 2009. 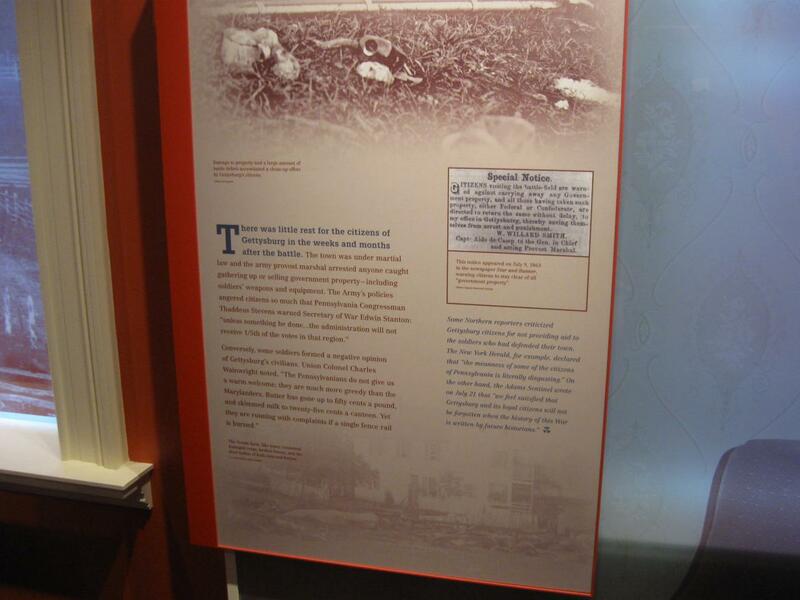 The display under the middle window has four artifacts. We’ll show them from left to right. 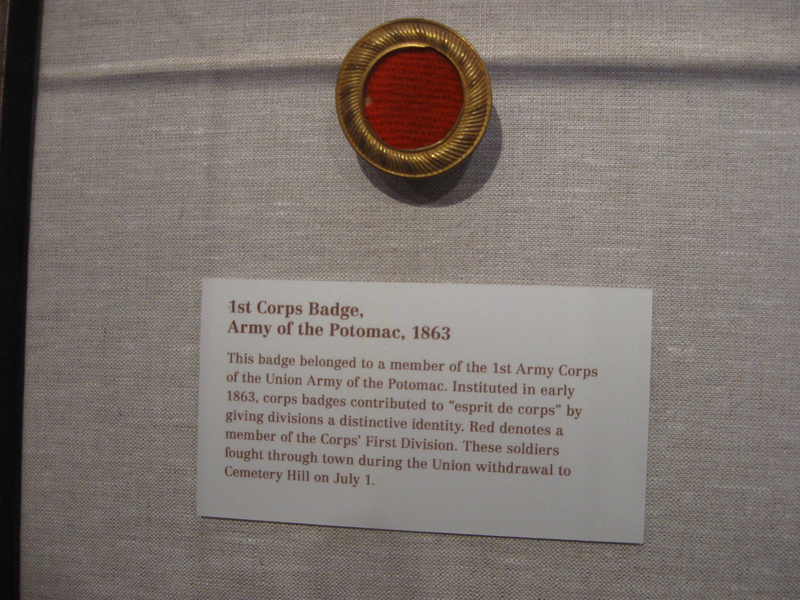 The first is a First Corps Badge of the United States Army. This view was taken facing west at approximately 4:15 PM on Wednesday, February 18, 2009. 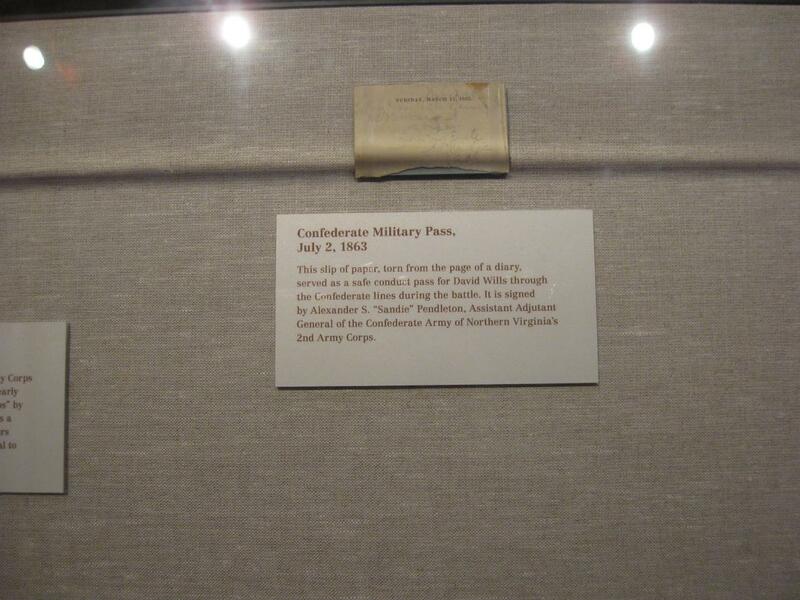 David Wills’ military pass. This view was taken facing west at approximately 4:15 PM on Wednesday, February 18, 2009. 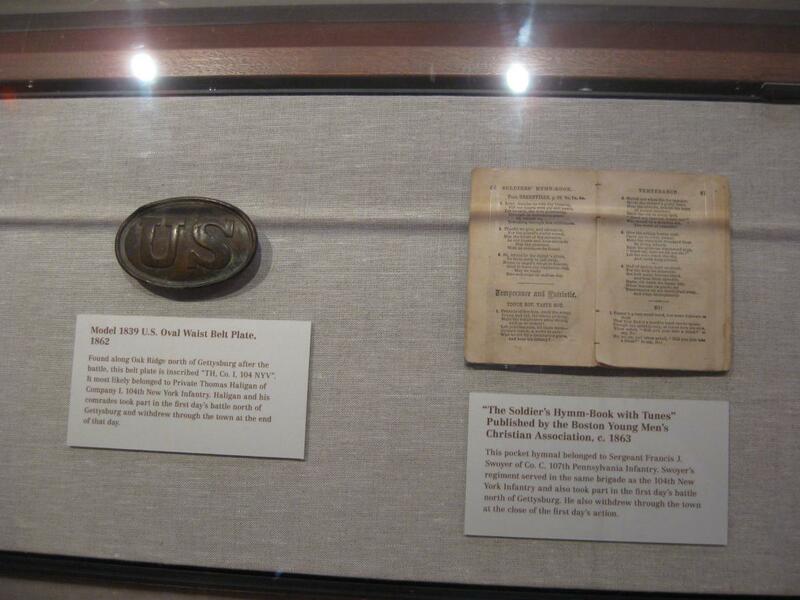 A belt buckle and a hymnbook. This view was taken facing west at approximately 4:15 PM on Wednesday, February 18, 2009. 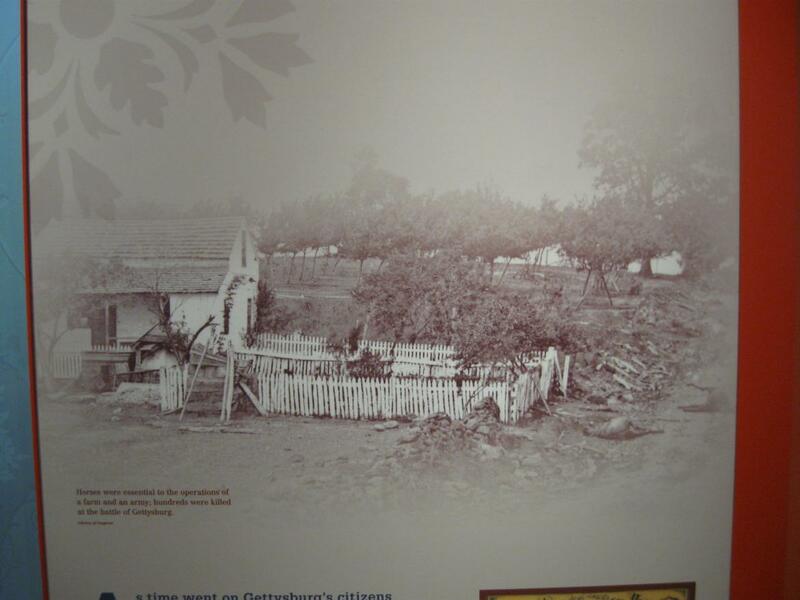 The right window on the wall displays another scene from west of town, not from the Diamond. This view was taken facing southwest at approximately 4:15 PM on Wednesday, February 18, 2009. 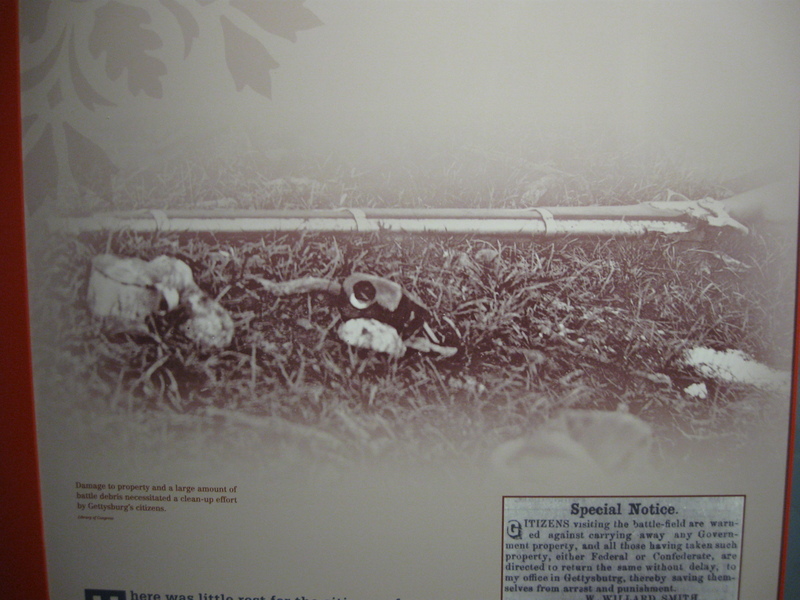 This panel describes the initial cleanup after the battle. This view was taken facing west at approximately 4:15 PM on Wednesday, February 18, 2009. The top of the panel. This view was taken facing west at approximately 4:15 PM on Wednesday, February 18, 2009. The bottom of the panel. This view was taken facing west at approximately 4:15 PM on Wednesday, February 18, 2009. On our next Wills House post we will finish up the parlor by showing you items on its south wall. This view was taken facing southwest at approximately 4:15 PM on Wednesday, February 18, 2009.